LAKEVIEW Home with panoramic views & directly across from childrens park! Recently renovated including dream kitchen that offers beautiful granite countertops, antiqued cupboards & newer stainless appliances; Hardwood floors, Crown mouldings, Gas FP, Double Glass French Doors opening onto huge sundeck with Hot Tub. 2009 Renovations included 50 Yr Metal Roof, New bathroom upgrades, Fixtures, Furnance w/Air. Huge 1/4 Acre lot spans between both roads, with extensive landscaping that includes fruit trees & allen block retaining walls. Kids stroll across the street to a huge playground & field! 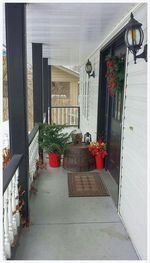 Located in prestigious Raven Sub-div that connects to kms of walking trails. Great family home! See more info at www.BIGRob.ca, then Call Rob McKibbon locally at 250-804-6288 or Toll Free at 1-866-463-2791. SOLD@BIGRob.ca, Thanks for your interest!